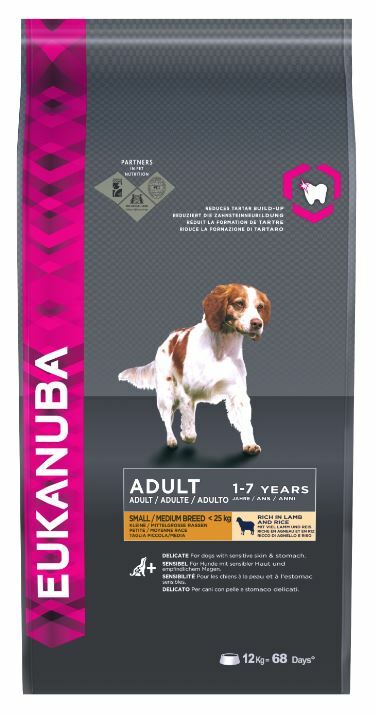 Eukanuba Adult Small & Medium Breed Rich in Lamb & Rice provides the optimal daily amount of protein, fat, carbohydrates, important vitamins and minerals for the health and well-being of your dog. With high-quality ingredients and high levels of animal-based protein, this food is for dogs with a sensitive skin and tummy and those who prefer the taste of lamb. A 100% complete and balanced nutrition for small/medium breed adult dogs with an average activity level and normal weight. Recommended For: Adult small and medium breed (<25kg and 1-7 years). Dried Chicken And Turkey, Lamb (>14%), Rice (>14%), Maize, Sorghum, Barley, Dried Whole Egg, Animal Fat, Dried Beet Pulp (>25%), Chicken Digest, Fish Meal, Potassium Chloride, Sodium Chloride, Calcium Carbonate, Sodium Hexametaphosphate, Fish Oil, Fructooligosaccharides (015%). Vitamin A (12000 IU/kg), Vitamin D (750 IU/kg), Vitamin E α-Tocopherol (200 mg/kg), β-Carotene (1 mg/kg). Contain Iron (Ferrous Sulphate), Heptahydrate (194 mg/kg), Zinc (Zinc Oxide 162 mg/kg), Manganese (Manganous Oxide 22 mg/kg), Manganese (Manganous Sulphate), Monohydrate (16 mg/kg), Copper (Cupric Sulphate), Pentahydrate (12 mg/kg), Iodine (Potassium Iodide 2 mg/kg), Cobalt (Basic Cobaltous Carbonate), Monohydrate (0.4 mg/kg). * For dogs > 25kg we recommend feeding Adult Large Breed rich in Lamb & Rice. There are currently no questions for Eukanuba Adult Small/Medium Breed Lamb & Rice Dog Food - be the first to ask one!